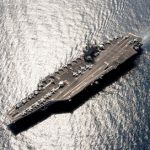 The U.S. Navy has extended the presence of the USS Harry S. Truman aircraft carrier in the Arabian Gulf by 30 days as part of an effort to combat the Islamic State militant organization, DoD News reported Monday. Terri Moon Cronk writes Chief of Naval Operations Adm. John Richardson told reporters Monday at the Pentagon the initiative also seeks to increase maritime security in the region. Richardson added the aircraft carrier lends intelligence, surveillance and reconnaissance support to U.S.’ Arabian Gulf allies, according to the report. The report said USS Truman is built to perform maritime security operations, expeditionary power projection, crisis response, sea control, deterrence and counterterrorism missions.